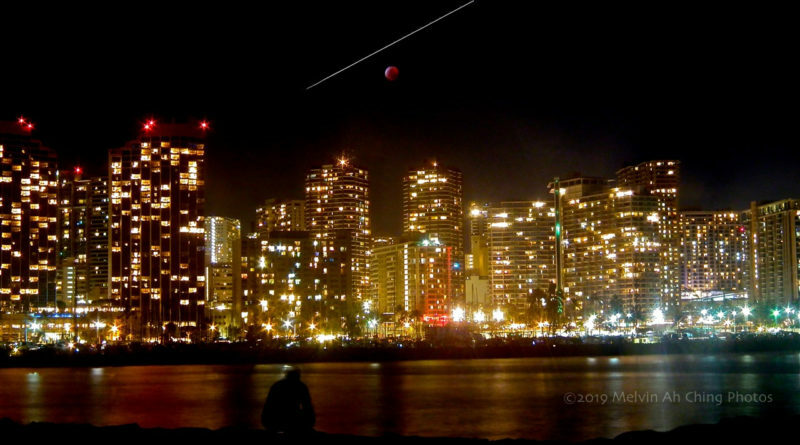 The lunar eclipse of 2019 was in full totality at moonrise in Honolulu. As the moon rose in the East beyond the Koolau’s it was near totality. Totality was not visible from Honolulu until after the moon cleared the mountains, treating thousands of onlookers to a fabulous celestial sight. Blood red as these eclipse events are always billed, the shadow of the Earth covered the sunlit half of the full moon at just the right angle to create the spectacular image. Thousands of people flocked to Ala Moana Beach Park and Magic Island to see the eclipse in Honolulu and elsewhere in the city. Reports came from other parts of the state as well as the nation reporting a spectacular sight and mostly clear skies. The sky in Hawaii was clear in Honolulu. Perfect night for an eclipse. The following images show the eclipse as it started at moon rise in totality before it gradually waned to become a normal full moon again. From totality back to normalcy. This is what most Honolulu residents saw as the moon arose in totality and gradually made it back to a normal full moon. The path of lunar totality and coverage shown in this graphic from NASA.